Team Germany Wins the 2009 Solar Decathlon! 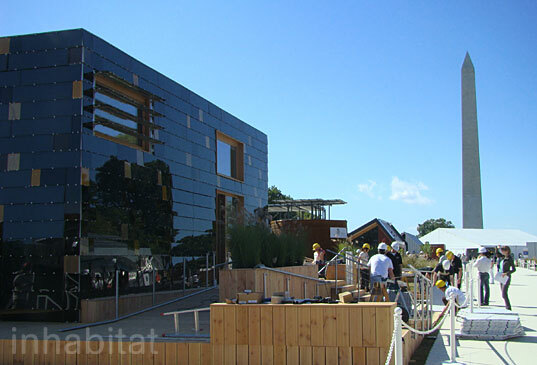 GERMANY WINS THE 2009 SOLAR DECATHLON! A scoring of a full 150 points out of 150 in the Net Metering category tipped the scales in Germany’s favor early this morning and allowed the Darmstadt University team to once again overcome being one of the only foreign teams in the competition and reign supreme — check out our full story about the surPLUShome here! Why is this a surprise? Germany and a number of other European countries have been building sustainable housing for decades now. The US has barely started and is a long way behind in terms of experience. I'm sure the US will catch up one day, but not as long as the majority of the population are so anti-sustainability and it could take a good decade to slowly change that from the current position. The house is beautiful. Very cool that it can produce twice the amount of electricity that it needs! It's interesting to imagine a future where all houses are this productive-- would we even need that much electricity? Cool! What a neat-looking building. There's something to be said for really cool examples of this technology, even if this particular example won't be coming to a neighborhood near you anytime soon. Sounds like an exciting competition! This certainly is a stunner~! Bravo on a magnificent, thoughtful home!